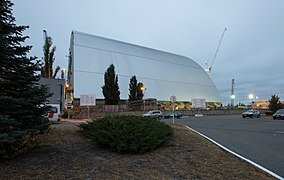 The New Safe Confinement (NSC or New Shelter) is a structure built to confine the remains of the number 4 reactor unit at the Chernobyl Nuclear Power Plant, which was destroyed during the Chernobyl disaster in 1986. The structure also encloses the temporary Shelter Object (sarcophagus) that was built around the reactor immediately after the disaster. The NSC is designed to prevent the release of radioactive contaminants from the existing shelter, protect the reactor from external influence, facilitate the disassembly and decommissioning of the reactor, and prevent water intrusion. The NSC is a megaproject that is part of the Shelter Implementation Plan and supported by the Chernobyl Shelter Fund. It was designed with the primary goal of confining the radioactive remains of reactor 4 for the next 100 years. It also aims to allow for a partial demolition of the original sarcophagus, which was hastily constructed by Chernobyl liquidators after a beyond design-basis accident destroyed the reactor. The word confinement is used rather than the traditional containment to emphasize the difference between the containment of radioactive gases—the primary focus of most reactor containment buildings—and the confinement of solid radioactive waste that is the primary purpose of the New Safe Confinement. In 2015, the European Bank for Reconstruction and Development (EBRD) stated that the international community was aiming to close a €100 million funding gap, with administration by the EBRD in its role as manager of the Chernobyl decommissioning funds. The total cost of the Shelter Implementation Plan, of which the New Safe Confinement is the most prominent element, is estimated to be around €2.15 billion (US$2.3 billion). The New Safe Confinement accounts for €1.5 billion. The French consortium Novarka with partners Vinci Construction Grands Projets and Bouygues Travaux Publics designed and built the NSC. Construction was completed in the end of 2018. The original shelter, formally referred to as the Object Shelter and often called the sarcophagus, was constructed between May and November 1986. It was an emergency measure to confine the radioactive materials within reactor 4 at the Chernobyl nuclear power plant (ChNPP). The shelter was constructed under extreme conditions, with very high levels of radiation, and under extreme time constraints. The Object Shelter was moderately successful in confining radioactive contamination and providing for post-accident monitoring of the destroyed nuclear reactor unit; it has been estimated that up to 95% of the original radioactive inventory of reactor 4 remains inside the ruins of the reactor building. The Object Shelter is primarily supported by the damaged remains of the reactor 4 building. These are largely considered to be structurally unsound as a result of explosive forces caused by the accident. Three major structural members support the roof of the Object Shelter. Two beams, usually referred to as B-1 and B-2, run in an east-west direction and support the roof beams and panels. A third, more massive member, the "Mammoth Beam", spans the largest distance across the roof from east to west and assists in supporting the roof beams and panels. The roof of the shelter consists of 1 metre (3 ft 3 in) diameter steel pipes laid horizontally north to south, and steel panels that rest at an angle, also in the north-south direction. The Object Shelter was never intended to be a permanent containment structure. Its continued deterioration has increased the risk of its radioactive inventory leaking into the environment. Between 2004 and 2008, workers stabilized the roof and western wall of the shelter. However, construction of the NSC was necessary to continue confining the radioactive remains of ChNPP reactor 4. Further upgrades to the area in preparation for NSC construction were completed in 2010. These included road and rail connections, site services (power, water, drains, and communications), facilities for workers (including medical and radiation protection facilities), and the installation of a long-term monitoring system. The NSC design is an arch-shaped steel structure with an internal height of 92.5 metres (303.5 ft) and a 12-metre (39.4 ft) distance between the centers of the upper and lower arch chords. The internal length of the arch is 245 metres (803.8 ft), and the external length is 270 metres (885.83 ft). The dimensions of the arch were determined based on the need to operate equipment inside the new shelter and decommission the existing shelter. The overall span of the structure is 150 metres (492.1 ft), consisting of 13 arches assembled 12.5 metres (41 ft) apart to form 12 bays. Vertical walls assembled around, but not supported by the existing structures of the reactor building seal the ends of the structure. The arches are constructed of tubular steel members and are externally clad with three-layer sandwich panels. These external panels are also used on the end walls of the structure. Internally, polycarbonate panels cover each arch to prevent the accumulation of radioactive particles on the frame members. Large parts of the arches were shop-fabricated and transported to the assembly site 180 metres (590 ft) west of reactor 4. Each of the steel tubes is made of high-strength steel to reduce cost and assembly weight. The steel used in the construction of the tubular members has a yield strength of no less than 2,500 kg/cm2 (250 MPa; 36,000 psi). Warm, dry air will be circulated in the gap between inner and outer roof sections to prevent condensation, which will reduce corrosion and prevent water from dripping into the interior. Convert the destroyed ChNPP reactor 4 into an environmentally safe system (i.e. confine the radioactive materials at the site to prevent further environmental contamination). Reduce corrosion and weathering of the existing shelter and the reactor 4 building. Mitigate the consequences of a potential collapse of either the existing shelter or the reactor 4 building, particularly in terms of confining the radioactive dust that would be produced by such a collapse. Enable safe demolition of unstable structures (such as the roof of the existing shelter) by providing remotely operated equipment for their demolition. Qualify as a nuclear entombment device. They must support the weight of the arches of the NSC. They must support rail tracks across which the NSC can roll 180 metres (590 ft) from the construction site into place over reactor 4. They must minimize the amount of digging and cutting into the upper layers of the ground, as the upper soil is heavily contaminated with nuclear material from the disaster. The site of the NSC is slightly sloped, ranging in elevation from 117.5 metres (385 ft) on the eastern side to 144 metres (472 ft) on the western side. The foundation was required to account for this difference without extensive site leveling. The ground upon which the foundation was built is unique in that it contains a technogenic layer just below the surface that is approximately 2.5 to 3 metres (8 to 10 ft) in overall depth. Radioactive contamination from the accident created the technogenic layer. It consists of various materials including nuclear material, stone, sand, loamy sands, unreinforced concrete, and construction wastes. It is considered unfeasible to determine the geotechnical characteristics of this soil layer. As a result of this, no assumptions about the load-bearing properties of the technogenic layer were made during the design of the foundation. The water table at ChNPP fluctuates from 109.9 metres (360.6 ft) on average in December to 110.7 metres (363.2 ft) on average in May. Several options were considered for the foundation design for the NSC. Ultimately, the final design was specified as consisting of three lines of two 4.50-by-1.00-metre (14.76 by 3.28 ft) foundation panels, each 21 metres (68.9 ft) in length, and a 4-metre (13.1 ft) high pile cap that reaches to a height of 118 metres (387 ft) of elevation. This option was selected to minimize the cost of the foundation, the number of cuts into radioactive soil layers, dose uptake of workers, and risk to the environment from further contamination. The foundation has a slight elevation difference between the area in which the NSC was constructed and the final resting area around reactor 4. Special consideration was necessary for the excavation required for foundation construction due to the high level of radioactivity found in the upper layers of soil. The conceptual designers of the NSC recommended the use of rope operated grabs for the first 0.3 metres (11.8 in) of pile excavation for the Chernobyl site. This reduced the direct exposure of workers to the most contaminated sections of the soil. Deeper excavation for the foundation piles were accomplished using hydraulic clam shells operated under bentonite slurry protection. The foundation is designed to withstand horizontal acceleration structural loads of up to 6998800000000000000♠0.08 g, as well as to withstand an F3 tornado. The original design for the structure required it to withstand an F1 tornado until an independent beyond-design-basis analysis was carried out to evaluate the effects of an F3 tornado on the structure. Stabilization of the Object Shelter to prevent collapse during construction. Excavation and construction of the foundation. Assembly of first and second arches to form Bay 1, installation of east wall on arch 1. Bay 1 was slid East to accommodate the construction of arch 3 and Bay 2. Subsequent sliding of the complete structure and adding of arches and bays to complete the structure. Installation of cranes and large maintenance equipment. Installation of the west wall. Final slide into place over reactor 4. This process of assembly was deemed advantageous because it took advantage of the designed mobility of the structure to maximize the distance between workers and the reactor building, thereby minimizing their exposure to radiation. As each bay was completed, infrastructure equipment—including that for ventilation systems, radiation monitoring, plumbing, and electrical was installed. The NSC was constructed 180 metres (590 ft) west of reactor 4, and slid into place. Sliding of the structure along foundation rails was a difficult process. It was pushed on teflon pads by hydraulic pistons, and guided by lasers. As of 2018[update], the NSC is the world's largest movable land-based structure. Two options were initially considered for moving the structure: hydraulic jacks to push the structure forward, or pulling the structure with large, multi-stranded steel cables. The first option would require the relocation of the hydraulic jacks after each push. This process would necessitate more worker interaction with the system and a greater worker exposure to radiation. The second option was initially chosen because it would expose workers to a lower radiation dose, and would have moved the structure into its final position in less than 24 hours. However, the structure was moved using hydraulic jacks, beginning the 327-metre (1,073 ft) move on November 14, 2016, and finishing on November 29. The operational phase of the NSC will involve the demolition of the unstable structures associated with the original Object Shelter. The goal of demolition has imposed significant requirements upon the load carrying capacity of the arches and foundation of the NSC, as these structures must carry the weight of not only the disassembled structure, but also the suspended cranes to be used in demolition. The NSC design includes two bridge cranes suspended from the arches. These cranes travel east to west on common runways and each has a span of 84 metres (276 ft). One typical lifting carriage with a 50-tonne (55-ton) carrying capacity. One secure lifting carriage for shielded transportation of personnel, with a 50-tonne (55-ton) carrying capacity. One carriage suspends a mobile tool platform, extending up to 75 metres (246 ft), that can be fitted with a variety of end actuators useful for demolition. The cranes' carriage interchangeability allows the rotation of the largest members to be demolished, reducing the overall size of the NSC by approximately one arch bay. After the members to be demolished are removed by crane they must be fragmented into pieces small enough to decontaminate. It is expected that the primary contamination of most demolished elements will be loose surface dust and can easily be removed. Decontamination will take place using vacuum cleaners with HEPA filters, grit blasting (for steel elements), and scarifying (for concrete elements). Once decontaminated to the maximum extent practical, pieces will be further fragmented for eventual disposal. Fragmentation tools include plasma arc cutting torches, diamond circular cutting wheels, and diamond wire cutting. The tools selected for the demolition process were selected based on a number of factors including minimization of individual and collective radiation exposure, the amount of secondary waste generated, the feasibility of remote operation, the cutting efficiency, fire safety, capital cost and operating costs. The exact methods for disposing of wastes generated by the demolition process have not been determined, and may include on-site burial outside the NSC for low-level waste, and long-term storage inside the NSC for medium and high-level wastes. As of 2018[update] no policy has been decided for the disposal and processing of fuel containing materials. Materials added after the Chernobyl accident to mitigate its consequences. Near to the Chernobyl site, the Vector Radioactive Waste Storage Facility is being built, consisting of the Industrial Complex for Solid Radwaste Management (ICSRM), a nuclear waste storage site. It is being constructed by Nukem Technologies, a German nuclear decommissioning company, a subsidiary of the Russian Atomstroyexport. This storage is reported to be able to contain 75,000 cubic metres (98,000 cubic yards). The storage is for both temporary high level waste as well as low and intermediate long-term level waste storage. Radioactive dust in the shelter is monitored by hundreds of sensors. Workers in the 'local zone' carry two dosimeters, one showing real-time exposure and the second recording information for the worker's dose log. Workers have a daily and annual radiation exposure limit. Their dosimeter beeps if the limit is reached and the worker's site access is canceled. The annual limit (20 millisieverts) may be reached by spending 12 minutes above the roof of the 1986 sarcophagus, or a few hours around its chimney. The New Safe Confinement (NSC) was originally intended to be completed in 2005, but the project has suffered lengthy delays. An international tender for NSC design and construction was announced. Two bid candidates were identified, but in September 2006 the plant's general director Ihor Hramotkyn announced his intent to annul all bids on the project. The project contract was signed, with French consortium Novarka [de] (consisting of Vinci Construction Grands Projets and Bouygues Construction as 50/50 partners) constructing the 190 by 200 metres (620 by 660 feet) arch structure. Construction costs were estimated at $1.4bn with a project time of five years. The estimated time for completion was given as 53 months, including 18 months of planning and design studies, with a projected completion in mid-2012. Progress was made with stabilization of the existing sarcophagus, which was then considered stable enough for another 15 years. Some project milestones, including infrastructure and preparatory work such as the NSC pilings, were completed. The first sections were raised. The second lifting operation on the eastern arch was performed. The fully lifted eastern arch was moved 112 metres (367 feet) eastward on its rails to a parking position to clear the construction area for building the western arch. The western arch completed the second of three lifting operations which raised the height of the arch. Successfully completed the third ascent of the western part arches. The two arches were fused, and the west wall was under construction. Construction of the arches was completed. The arch slipping procedure began. The NSC slipping was completed, taking a total of fifteen days. It was pushed on teflon pads by hydraulic pistons, guided by lasers. Development company Rodina began the construction on the first PV project to be developed within the Chernobyl exclusion zone. 3,762 solar modules would be installed at the site with a generation capacity of 7006100000000000000♠1 MW. Construction completion is delayed until late 2018 due to a contractor being unable to finish its work in time. The reason is the extremely high level of radiation, forcing workers to limit their presence at the site to a minimum. Various subsystems are in operation, including the radiation monitoring system, the back-up power supply system, the fire protection system, as well as lighting, communication, and HVAC. In 1992, Ukraine's government held an international competition for proposals to replace the sarcophagus. In the autumn of 1992, Design Group Partnership (DGP) of Manchester was invited to assist the Atomic Energy Authority (AEA) for the UK's submission for the international competition organized by the Ukrainian government. Off-site construction would minimize radiation doses of construction workers. An arch would fit snugly over the damaged reactor excluding its chimney. An arch would be easier to slide than a square box. Of the 394 entries, only the British submission proposed a sliding arch approach. There was no top design choice, but the French submission came as second best with the UK and German proposals coming joint third. Subsequently, a pan-European study (the TACIS programme) re-examined the proposals of the competition's top three finalists. The study selected the sliding arch proposal as the best solution for their further investigations and recommendations, primarily to reduce the chance of the construction workers receiving a harmful dose of radiation. On 17 September 2007 Vinci Construction Grands Projets and Bouygues Travaux Publics announced that they won the contract to build the New Safe Confinement as 50/50 partners of a French consortium named Novarka. The original 432 million euros contract comprises the design and construction of the NSC and planned to employ 900 people at its peak. The project has involved workers and specialists from at least 24 countries in addition to Ukraine. The European Bank for Reconstruction and Development (EBRD) is responsible for managing the Shelter Implementation Plan, including overseeing the construction of the New Safe Confinement. ^ a b "Chernobyl confinement structure systems begin operation - World Nuclear News". world-nuclear-news.org. World Nuclear Association. February 8, 2019. Retrieved February 9, 2019. ^ a b "Chernobyl Shelter To Begin Full Operation In December, Says Ukraine President". www.nucnet.org. The Independent Global Nuclear News Agency. Retrieved September 12, 2018. ^ a b c "Chernobyl's New Safe Confinement". European Bank for Reconstruction and Development. Retrieved May 31, 2018. ^ a b "Transforming Chernobyl brochure". EBRD. March 11, 2015. Retrieved September 13, 2018. ^ a b c Reiserer, Axel (April 8, 2011). "NOVARKA and Chernobyl Project Management Unit confirm cost and time schedule for Chernobyl New Safe Confinement". European Bank for Reconstruction and Development. Archived from the original on September 18, 2011. Retrieved August 16, 2011. 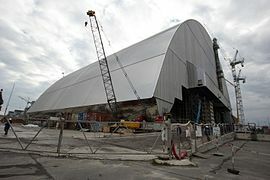 ^ a b c "Vinci and Bouygues sign contract to build Containment Shelter for the Chernobyl Sarcophagus" (PDF). Archived from the original (PDF) on October 2, 2011. Retrieved April 19, 2011. ^ a b c "Unique engineering feat concluded as Chernobyl arch has reached resting place". European Bank for Reconstruction and Development. November 29, 2016. Retrieved January 12, 2018. ^ Vidal, John (April 19, 2011). "Ukraine raises $785m to seal Chernobyl under new 'shell'". The Guardian. Retrieved March 2, 2018. ^ "Chernobyl 25 years on: New Safe Confinement and Spent Fuel Storage Facility" (PDF). European Bank for Reconstruction and Development. January 2011. Retrieved March 2, 2018. ^ a b Excell, John (February 11, 2013). 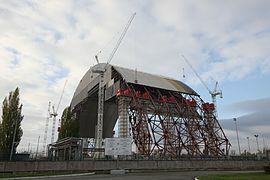 "Building Chernobyl's New Safe Confinement". The Engineer. ^ a b "Chernobyl New Safe Confinement: a one-of-a-kind project" (PDF). Vinci SA. November 29, 2016. p. 21. Retrieved March 2, 2018. ^ a b c "Chernobyl disaster: Giant shield begins move towards reactor". BBC News. November 14, 2016. Retrieved November 30, 2016. ^ Borys, Christian (January 3, 2017). "A vast new tomb for the most dangerous waste in the world". BBC Future Now. Retrieved March 2, 2018. ^ "Industrial Complex For Solid Radwaste Management (ICSRM) at Chernobyl Nuclear Powerplant" (PDF). Nukem Technologies. May 2008. Archived from the original (PDF) on December 3, 2008. Retrieved July 31, 2008. ^ Gache, Gabriel (April 25, 2008). "Chernobyl Receives Nuclear Waste Processing Complex". Softpedia.com. ^ "Nuclear waste storage inaugurated in Chernobyl". EU Business. Archived from the original on July 24, 2008. ^ Tokarevskyi, O.; Alekseeva, Z.; Kondratiev, S.; Rybalka, N. (November 2013). Safety issues in construction of facilities for long-term storage of radioactive waste at Vector site (PDF). Eurosafe Forum 2013. Cologne, Germany. inis..RN:45021661. Retrieved January 12, 2018. ^ Lee, William E.; Ojovan, Michael I.; Jantzen, Carol M. (October 31, 2013). Radioactive Waste Management and Contaminated Site Clean-Up: Processes, Technologies and International Experience. Elsevier Science. pp. 404–406. ISBN 978-0-85709-744-6. ^ a b c Hankinson, Andrew (January 3, 2013). "Containing Chernobyl: the mission to defuse the world's worst nuclear disaster site". Wired. ^ a b Meo, Nick (November 26, 2013). "Chernobyl's arch: Sealing off a radioactive sarcophagus". BBC News. ^ "Chernobyl New Safe Confinement - New Completion Date Announced". Chernobyl and Eastern Europe. February 15, 2010. Archived from the original on July 8, 2011. Retrieved March 16, 2011. ^ "Chernobyl to be covered in steel". BBC News. September 18, 2007. Retrieved May 20, 2010. ^ "Work begins on new sarcophagus for Chernobyl reactor". Nuclear Power Daily. September 24, 2010. Retrieved March 16, 2011. ^ "Workers raise first section of new Chernobyl shelter". 3 News. Associated Press. November 28, 2012. Archived from the original on February 23, 2013. ^ Heintz, Jim (November 17, 2012). "Workers raise 1st section of new Chernobyl shelter". Associated Press. Archived from the original on January 20, 2013. Workers have raised the first section of a colossal arch-shaped structure that eventually will cover the exploded nuclear reactor at the Chernobyl power station. ^ "$1.7B Giant Arch to Block Chernobyl Radiation For Next 100 Years". NBC News. Reuters. March 24, 2016. Retrieved November 20, 2016. ^ "Unique engineering feat concluded as Chernobyl arch has reached resting place" (Press release). European Bank for Reconstruction and Development. November 29, 2016. Retrieved November 30, 2016. ^ "Rodina begins construction on first PV project inside Chernobyl exclusion zone". PV Tech. Retrieved November 17, 2017. ^ "Ukraine postpones Chernobyl reactor safety cover". Xinhua News Agency. Retrieved November 20, 2017. ^ Seidler, Christoph (December 20, 2017). "Strahlung zu hoch: Fertigstellung des Tschernobyl-Sarkophags verzögert sich". Spiegel Online (in German). Retrieved December 20, 2017. ^ Smith, Stuart; Lacombe, Herve (February 1997). "A second shelter for Chernobyl: Its necessity and feasibility". Proceedings of the Institution of Civil Engineers. 120 (1): 2–14. doi:10.1680/icien.1997.29157. ^ Onishi, Yasuo; Voitsekhovich, Oleg V.; Zheleznyak, Mark J. (June 3, 2007). Chernobyl - What Have We Learned? : The Successes and Failures to Mitigate Water Contamination Over 20 Years. Springer Science & Business Media. p. 248. ISBN 978-1-4020-5349-8. Schmieman, Eric; Wrona, Matthew; et al. (2004). 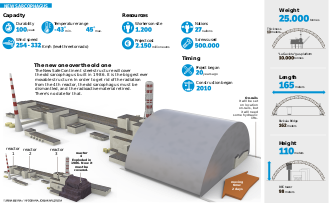 Conceptual Design of the Chornobyl New Safe Confinement— An Overview (PDF). Pacific Basin Nuclear Conference. Archived from the original (PDF) on June 4, 2011. "Chornobyl: Five-Year Schedule set for New Safe Confinement Over Wrecked Unit". June 9, 2003. Archived from the original on February 14, 2008. Wikimedia Commons has media related to Chernobyl Nuclear Power Plant New Safe Confinement.